A visit to the Rytivaara Crown tenant farm, built in the 1800s, is a trip back in time to the everyday life of a Crown tenant and the living conditions in days of yore. The Rytivaara house was built in 1852 on land of the Crown, i.e. the State, in the Syöte wilderness. When Metsähallitus was founded in 1859 to manage State-owned lands, it started making contracts with settlers. In these contracts the tenant farmers' rights and obligations were defined. 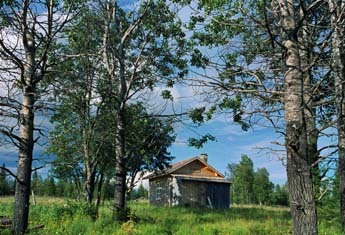 Rytivaara officially became a Crown tenant farm in 1870, when Matti Ollinpoika Kynsijärvi entered into a contract with Metsähallitus. Although life as a tenant farmer was modest, this arrangement offered a place to live for the farmer and his family. After Rytivaara was abandoned in the 1950s, time ate away at the house and the outbuildings, and they quickly fell into disrepair. In 2001 Metsähallitus started the restoration of Rytivaara, and today the house and its surroundings tell visitors of the modest living conditions of a bygone era. The restoration of Rytivaara began in 2001. The following buildings had to be rebuilt to a large extent: the Rytivaara house, the cooking hut, the storehouse, the cowshed-barn, the sauna, the stables and the fence that enclosed the farmyard. In this work the aim was to follow, as closely as possible, the methods of the old days and to save all of the old structures that could be saved. At the same time, the mowing of the farmyard was started. Thanks to regular mowing, the plant species of the farmyard have gradually returned, and in the meadow the harebell (Campanula rotundifolia), alpine bistort (Bistorta vivipara) as well as the near threatened leathery grape fern (Botrychium multifidum) thrive again. On the peripheries of the farmyard, which are exposed to the heat of the sun, Nardus stricta and the Lady's mantle (Alchemilla sp.) grow as well as the moon daisy (Leucanthemum vulgare). At nearby Latolamminsuo, a hay barn, a meadow sauna and a meadow dam were built in order to demonstrate the utilisation of the mire meadows. Rytitupa Reservable Wilderness Hut is now for rent for accomodation so it is possible to have a good sleep in Rytivaara nowadays. More information on the History of Rytivaara Crown tenant farm. The doors to the Rytivaara house and the outhouses are open all year round. There is no entrance fee to the buildings. There are no personnel at the Rytivaara tenant farm. More information on the Rytivaara Crown tenant farm is available at the Syöte Visitor Centre. There are signposts from Iso-Syöte road (no. 858) to the Rytivaara tenant farm. The distance from Syötekylä village to Rytivaara is about 18 km. The signposts lead you to the Ukonvaara parking area, from where the trail leading to the destination is roughly 4 km long. More information on directions and maps is available on the webpages of the Syöte National Park. Trips to Rytivaara are organised by the entrepreneurs of the Syöte National Park. More information on Rytivaara events is available at the Syöte Visitor Centre. You can go by car for a distance of 3.7 km from the Rytivaara farmyard. Walk the remaining stretch to the farmyard along a marked trail. In the Rytivaara farmyard there are buildings and an information board showing their location. In the Rytivaara faryard there is also a Reservable Hut Rytitupa where you can sleep. Reservations and keys from the Syöte Visitor Centre. At one end of the cowshed there is a dry toilet. From the sauna there is a path to the quagmire. The quality of the water has not been studied, and its use is at one's own risk. The lid of the well has been nailed shut. The house and its buildings function as an open-air museum. The oven in the house cannot be heated. There are no services for the disabled at the destination.